Odynerus simillimus was considered extinct in Britain until its rediscovery in 1986 in Norfolk. It is listed as Extinct (RDB1+) in Shirt (1987), but Falk (1991) provisionally places it in the Endangered (pRDB1) category. It is an extremely rare medium-sized whitish-yellow and black Eumenine wasp known from very few British or European specimens. The species has been associated with coastal grazing marsh and fens (Archer 2000), but the most recent discoveries suggest that in Britain the coastal association may be especially significant. 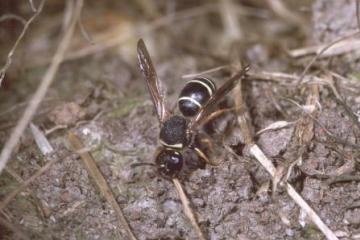 Nesting aggregations of Odynerus simillimus were discovered in August 2000 by David Scott (Harvey & Scott 2001) at Alresford, North Essex, and due to the international importance of the British populations the species was added to the Species Recovery Programme and was subject to autecological research (Harvey 2001, 2002) between 2001 and 2003.